What’s going on here then, I wondered. As though actually hearing my piquing concern, he then divulged, “I’ve started eating again now…” whereupon, before our next leg set, I listened to the fuller story of how his girlfriend of more than five years, his sweetheart and soul mate passing from adolescence into adulthood, had suddenly decided to leave him. Like Doanld Gennaro leaving Lex and Tim to face the escaping Tyrannosaurus, his best friend and the guardian of his heart had decided that she didn’t want to stay around or be part of his life any more. Jack’s heart was broken; Jack’s heart was churning. And Jack’s heart was off his food. On another occasion recently, a friend dropped me a line to arrange a pizza for lunch. Guffawing over our carbohydrate-heavy meal and respective metabolic rates, suddenly, like a silencer attached to Bond’s PPK, he slipped into conversation that he and his girlfriend had separated. On the joyful verge and magnitudinous prospect of marriage with her, a sudden schism in their love had appeared and an internal implosion of life-altering scale had followed. The next time I saw him a month or so later, my friend had visibly lost weight – not that he needed to – but as a result not only of regular, distracting exercise, also due to the the heart-churning emotions involved in love and…in heartbreak. My friend’s heart was broken, just like Jack’s, and the physical effort required to hold back his tears spoke a thousand words. Despite being the singularly most powerful human impulse, (next to breathing), my friend’s hunger and appetite was askew. Food was not to him what it should be, TV & film, a walk by the sea, the prospect of a new week of work or driving his car at speed. All his favourite things in life had kind of gone off, like a plastic bottle of neglected milk. I’ve been there too, as have you most likely, even if it was decades ago: whether unrequited love, an unhealthy relationship, an abusive relationship, the death – or worse – infidelity of your spouse. Circumstances of life in which our hearts are off-kilter, sick and, largely, inconsolable. There is a unique place in the human heart touched only by romantic, passionate, desirous love, the place where all our hopes and dreams congregate like passengers waiting on the underground for another destination. There is simply no other part of the human heart that is so potentially alive, content and at peace as well as also being so vulnerable to the utter disruption of all-consuming sickness. It is also the very same place – in a purely climactic sense – that God means us to live from. That while in pursuit of His face, His truth, His kingdom and glory that we would know not only the peace and contentment of love reciprocated, but also where our hearts would also learn to burn for the Coming King, our Bridegroom Jesus. Brennan Manning called this the furious longing of God – the life-changing discovery that this is how God feels and thinks and moves towards us. And it is going to be this reality that separates the sheep and the goat in this reforming time of church history. The three repetitions of this command throughout the book, ricocheting down the centuries, don’t mainly point to the all-consuming nature of romantic human love – our friendships on fire – but rather the virtually unimaginable fullness of the volcanic God of Love, Jesus Christ. We must recall these churning emotions from our own histories as something like smoking beacons showing us the way to our Heavenly Husband. Ultimately, the earthly union of husband and wife (one man and one woman) will one day give way to the original masterpiece, one that is sure but yet to be consummated. The most powerful men and women on the face of the planet – and within the body of Christ – are those who understand that Jesus is a Jewish Man, the Son of God, the second Person of the Trinity, God Almighty and the Transcendent Husband of His possession, His people, His family – His bride (See Psalm 2:8). But at the junction of their heart sicknesses, power isn’t the word you might use to describe Jack or my pizza-loving friend. Aren’t there other obvious nouns that we would use: weakness, obsession, infatuation, distress, devotion, emotion? Indeed, these echoes of worship reverberating in the ventricles of our own hearts are from the voluntary reachings of the inner man to treasure Christ above all else – as well as the more jolting lurches to live by faith and not by sight – and certainly the consummate ease of a wandering sheep recognising the voice of its Shepherd King. God is not unstable or weak or blinkered in any way – indeed, He is not human and He is perfect in all of His ways. Yet His heart does churn for His people in the way a Bridegroom longs for His bride. 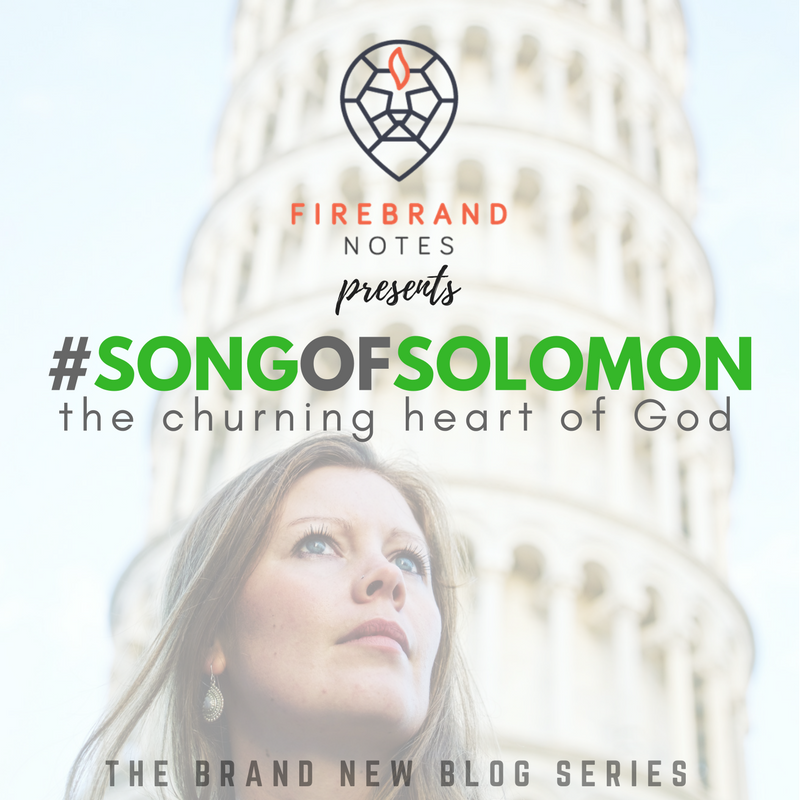 This is the ultimate message of the Song of Solomon. Lovely in the fiery, Hebrew meaning of the word love not the generic, diluted, impotent sense. Though we are often “dark” – half-hearted, indecisive, inconsistent, unbelieving and conflicted – it is the knowledge of God’s churning heart of affection and love for us that is the only power to transform us into faithful, voluntary and reciprocal lovers. (See Jesus’ prayer in John 17:26). In the weeks ahead, standing on the shoulders of stalwarts, we’re going to read through this magnificent book and come to see again and again that I am my Beloved’s and He is mine (6:3). We’ll dig in to the original Hebrew and uncover some of the subtle (and glaring) shades of meaning that hardly anyone ever preaches on. The heart of God churns for you in ways you perhaps haven’t come to experience and there is a love letter in the middle of your Bible to prove it. Please join me in writing this (4:16) on your Bibles, on your computer screens at work, on your Twitter accounts – wherever you can – and pray over and over that the Holy Spirit of Jesus will prepare your heart to see and respond to heart-churning things in your Husband that you’ve never seen before. Awake, north wind, and come, south wind! Blow on my garden, that its fragrance may spread everywhere. Let my beloved come into his garden and taste its choice fruits. Very exciting topic! SOS is my favorite book of the Bible. Have you read Brian Simmon’s The Journey of the Bride or his newest book, The Sacred Journey? Both books, along with Mike Bickle’s (Int’l House of Prayer) teachings on Song of Solomon revolutionalized my relationship with my Bridegrrom King. Looking forward to reading more of your series. Thanks so much, will definitely check Simmons out! Bickle is the man!